Use the Office 365 Adoption content pack within Power BI to gain insights on how your organization is adopting the various services within Office 365 to communicate and collaborate. 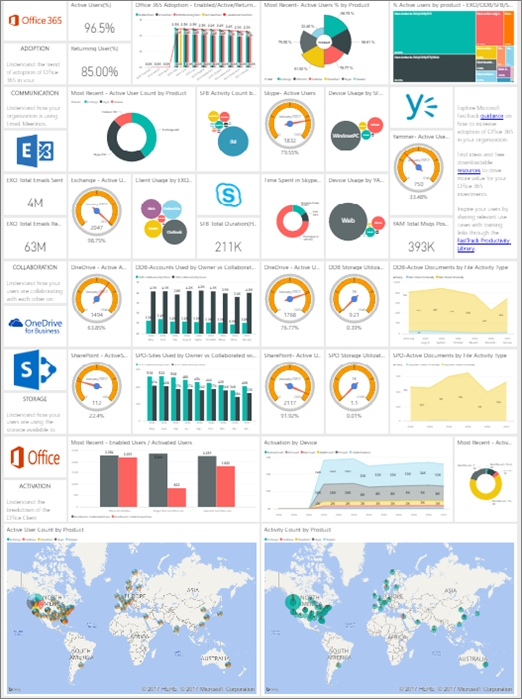 You can visualize and analyze Office 365 usage data, create custom reports and share the insights within your organization and gain insights into how specific regions or departments are utilizing Office 365. The content pack gives you access to a pre-built dashboard that provides a cross-product view of the last 12 months an contains a number of sections. Each section provides you with specific usage insights. By clicking on the top level metrics you can access more detailed reports. User specific information is available for the last month. 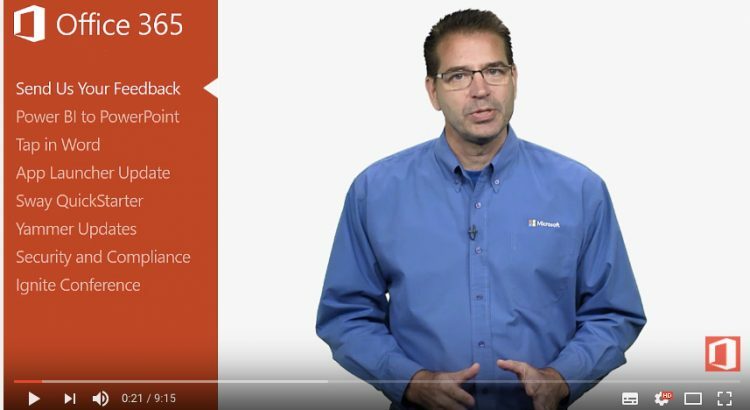 See Enable the Power BI adoption content pack for Office 365 to start collecting data. 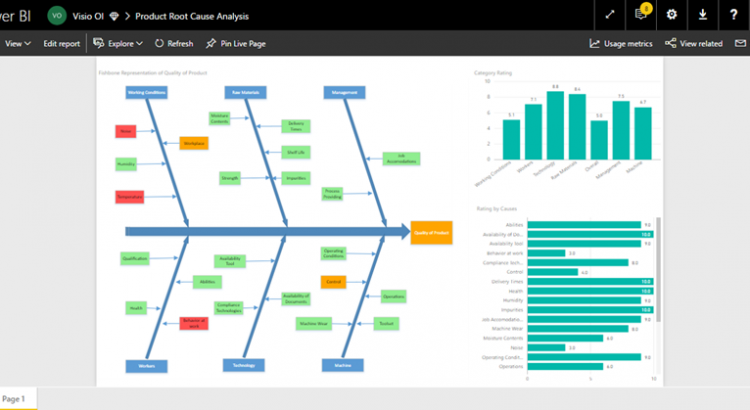 Visio and Power BI work better together than ever before thanks to the new Visio visualization. Any Visio user can sign up for the preview to start using this capability right away. Introducing an out-of-the-box web part for SharePoint Online using their new Modern Pages infrastructure. The new web part we are releasing today enables SharePoint authors to embed Power BI reports directly in SharePoint Online pages with no code required! 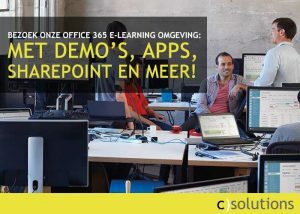 The feature is available today for Office 365 First Release customers. 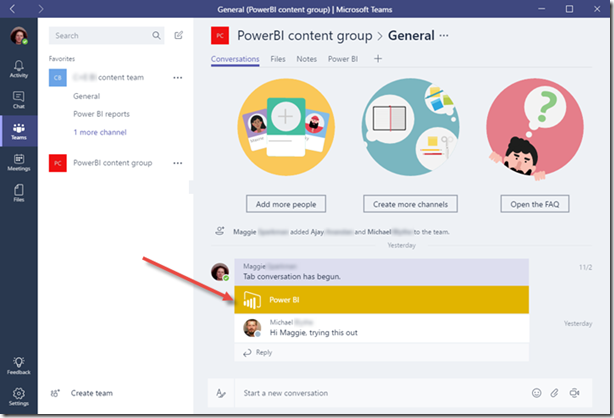 Have you seen the announcement about Microsoft Teams, the new chat-based workspace in Office 365? Check it out! 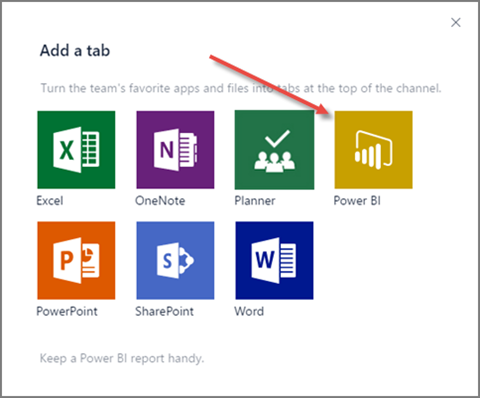 Groups in Power BI are built on Office 365 groups, too, so now you can add and interact with Power BI groups in your Microsoft Teams groups. f you’re an admin for a Power BI group, when you create a team in Microsoft Teams, the app suggests that you add Microsoft Teams functionality to your existing group. In your Microsoft Teams channel, you just tap the + sign, then add Power BI as a tab in your channel. Microsoft Teams automatically detects all the reports in your Power BI groups and in My Workspace. 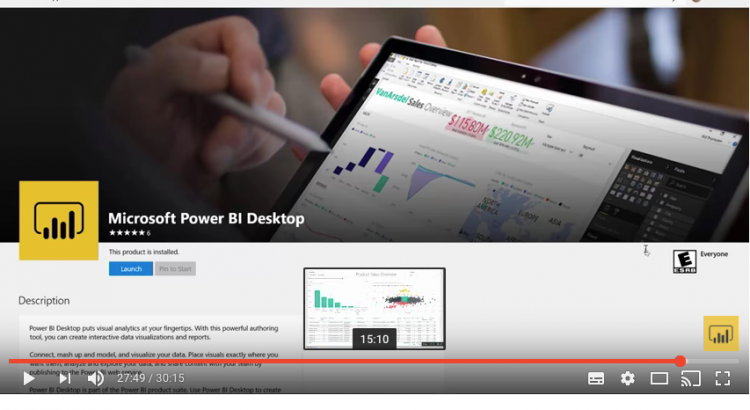 You can choose which ones to show in the Power BI tab in your channel. 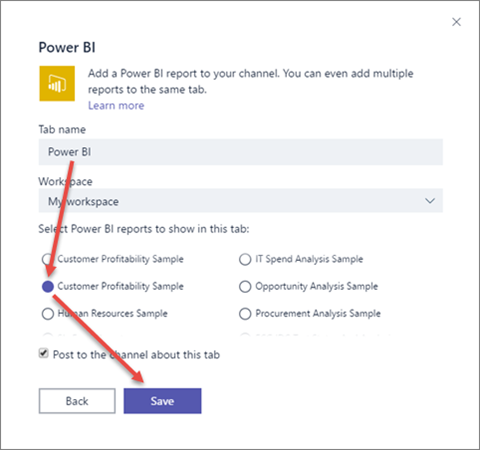 Now your Power BI report is handsomely displayed in your Microsoft Teams channel. 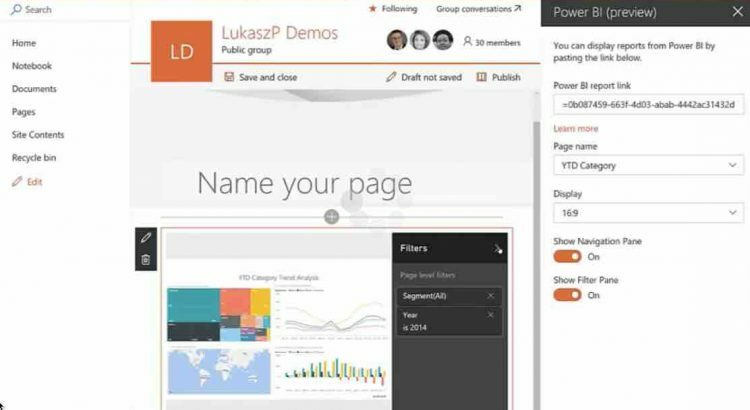 If your team isn’t taking advantage of groups in Power BI yet, now is a great time to try them. 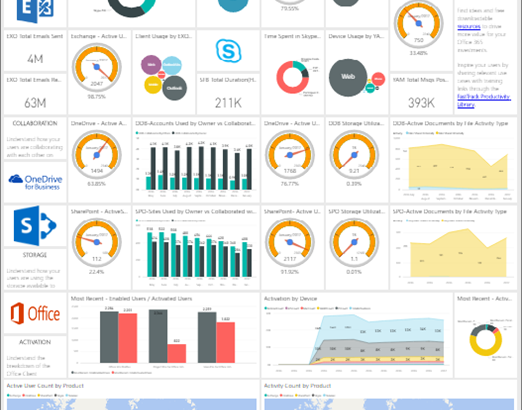 They’re a great way to share your dashboards, reports, and datasets with your coworkers. Read more about groups in Power BI. 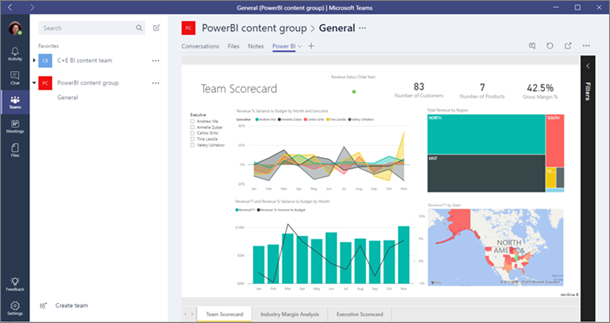 Then see how you can leverage your Power BI groups in Microsoft Teams!